Compte rendu dans Acta fabula: Le divan de la compagnie postcoloniale, par Didier Coste. Compte rendu dans l'Atelier de fabula: S'orienter dans les études postcoloniales, par Patrick Sultan. 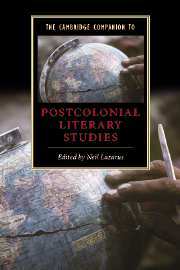 Cambridge University Press, 2004, 350 p.
A comprehensive introduction to postcolonialism, this Companion examines different aspects of postcolonial thought and culture that have had a significant effect on contemporary critical thought. Topics discussed by experts in the field include postcolonialism's relation to modernity, and its significance and relevance to literature, film, law, philosophy, and modern cultural studies. Additional material includes a guide to further reading and a chronology.